126 players came out to battle in the VFW near Waterbury, CT for The Mana Drain Open 17. First and foremost I want to thank Ray for putting on the event. This was my first TMD Open, and despite losing the last 3 rounds I had a blast the entire day. In addition, Ray sent me the decklists and round results in a convenient format so I could get this post up in a timely manner. Also a huge congratulations to Will Magrann for taking down the tournament and keeping the title. Note that Other includes Goblins, Elves, 5C Humans, 5C Hatebears, Cerebral Assassin, and Dark Times. Big Blue includes various Vault/Key decks and Painter. Hard Control includes Standstill and assorted other Mana Drain decks. Combo includes DPS, Belcher, and 2 Card Monte. The most prominent narrative, for me, is the gush vs. thorn narrative. It should be unsurprising that when a much higher percentage of gush decks are Grixis Therapy (located under the pyromancer subarchetype), that thorns improve against the gush archetype. From my personal experience, the grixis therapy matchup against thorn is slightly unfavored, and also very difficult to play correctly. Another surprising point is how poorly dredge did last Saturday. 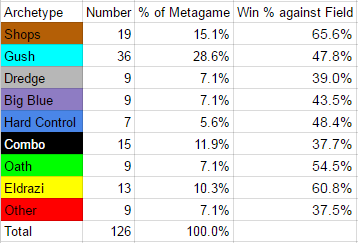 I don't have an immediate explanation for this, since looking at the lists it does not appear like dredge hate was more common. Please let me know if I have made any errors typing up or classifying decklists. Edit: Made several corrections to the decklists. Hopefully those are 100% accurate now. Not that I think it'll dramatically change numbers, but for completeness's sake I (Jon Celso) dropped after round 3 to help the judges out but didn't get dropped from the tourney until round 6. So I want to at least push on the idea that grixis is worse against thorns than mentor is. 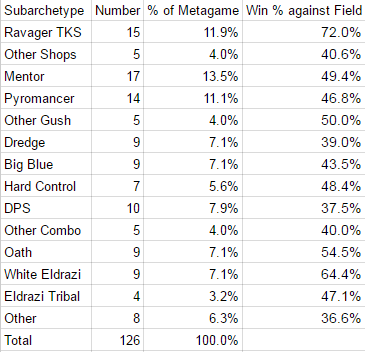 After comparing mentor and pyro win % against Ravager shops, Other shops, and white eldrazi it seems like pyro decks are slightly ahead. According to these results young pyro did worse against ravager shops, equivalently against other shops decks and (significantly) better against white eldrazi. I didn't include tribal eldrazi for 2 reasons, first, they don't always play thorn, and secondly, there was only one match between young pyro and eldrazi tribal. My experience has been that young pyro is low enough to the ground to make sphere effects not as threatening, in most lists there are only 2 cards that get routinely cast for more than 2 mana (Dack and JTMS) in those decks. Cabal therapy is also a very relevant card against shops and is better than fluster/MBT that mentor decks occasionally run as disruption against these thorn decks. Also, just as a sidenote, head to head it looks like young pyro is ahead of mentor 57-43 at this tournament. Obviously neither of these decks want to see ravager shops in a tournaments they are both under 50% against it, and mentor does have the better MU against this particular deck, but I think that has more to do with hangarback walker, ravager and trike matching up well with young pyro than it has to do with thorn and other sphere effects. One reason I could see is the strong showing of storm, oath, and other combo decks. While oath can be a toss up, storm and other combo decks are usually poor match ups for dredge. I think the reason for the weak showing is that of the dredge players there (and I was one) there were two first time pilots for sure, with only sullivan and travis being high level (that I am aware of). Dredge can be fairly high variance, and I dont think sullivan or travis had the best day. That combined with newbie dredgers is a good set of conditions for a weaker showing for the archrtype as a whole. I love the look of the Thalia tribal decks, I'm going to have to give this a spin. I'm happy to see Thalia 2.0 getting play and doing well. What is cerebral assassin? Also I'm not sure what deck I played in round one, but I can tell you that I'm not a fan of losing to a turn one smokestack ! GGs @Juggernaut-GO , I've never been more confused in a game of Magic ever, and those stacks were brutal. Almost every deck in the top sixteen was Eldrazi/Thorn/Shop category. Tribal Eldrazi is kind of different being based on Null Rod and not Thorns, but it's pretty close I think. I think that those decks just prey on Gush well enough to make them rise to the top, especially considering that Gush was the largest category. @Islandswamp In testing the night prior to the event my deck was doing very well against Ravager Shops. That's one of the matchups I hoped to get, but I didn't actually face. I did have to play against Smokestack and honestly I was somewhat under prepared for that. Cerebral Assasin is a fairly obscure deck, and never became that popular as a competitive, tourney-winning deck. On paper, it looks like it's great-but it falls short of completing it's many goals. The concept of Cerebral Assassin is, essentially, win. There are a number of win conditions built in to this deck, from Triskelion+WGD+Animate Dead to the number of tricks you can pull off with Welder. The problem with the deck is that it tries to use so many combos that you end up drawing the wrong things at the wrong time quite often. Though this deck is still quite good, it's not very viable for a powerful Vintage metagame. The object here is to do what you can to get either Welder fodder in the grave or Animate Dead Worldgorger Dragon with a Triskelion in play to create an infinite damage loop (you can also use Titan with this to some effect). @BalduvianBears Thanks. I updated it on the googledoc and will update the pictures in this thread once I am more confident I won't have to make any more changes to the data. @garbageaggro Right. Triskelion crushes grixis therapy, so much so that I've always run 2 null rods. And yes grixis therapy is very good against mentor. Unless mentor gets a nut draw, the pyro therapy engine gets up and running before mentor can make a showing. The snuff out also helps in this matchup quite a lot. A lot of aggro for a waterbury!